It is distinct from the older Bestwood Estate to the west. Development began during the late 1950s and early 1960s, whereas Bestwood Estate was developed during the 1930s. Glade Hill Primary and Nursery School and Robin Hood Primary School. Bestwood Park Church (Beckhampton Road), Infant of Prague Catholic Church (Cherry Orchard Mount), and The Peoples Church (Gladehill Road). Sandy Banks Local Nature Reserve (LNR), and Glade Hill wood. The latter is on a small hill and so visible from all around. It is erroneously known locally as "Bendigo's Ring" since the original place of this name, in Bestwood Estate, is much less visible. Bestwood Park Cricket Ground was a cricket ground laid out in 1867 by William Beauclerk, 10th Duke of St Albans in the Bestwood Park area. It hosted one important match when in 1879 a Nottinghamshire Eleven played the MCC. The ground is now a public recreation area. 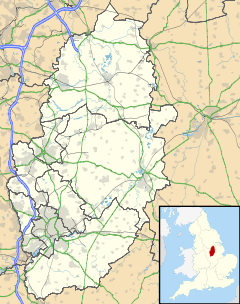 ^ "Nottingham/Bestwood Park". openstreetmap.org. 2009-11-06. Retrieved 2016-04-20. ^ Tony Proctor (2013-11-15). "Where is Bendigo's Ring?". Parallax View Blog. Retrieved 2016-04-20. ^ wearebase.com, Base,. "Service 88 on Purple Line". www.nctx.co.uk. ^ wearebase.com, Base,. "Service 89 on Purple Line". www.nctx.co.uk. ^ wearebase.com, Base,. "Service 89A on Purple Line". www.nctx.co.uk. ^ wearebase.com, Base,. "Service A2 on Grey Line". www.nctx.co.uk. ^ wearebase.com, Base,. "Service N89 on Purple Line". www.nctx.co.uk. ^ wearebase.com, Base,. "Locallink Service L11 ran by Nottingham Community Transport". www.nctx.co.uk.